As the temperatures start to climb, so can your energy bills. These smart energy saving tips for summer will help you stay cool without breaking the bank. The worst news any homeowner could receive in the summer is that their air conditioner is busted. People have to build up such a big sweat working their jobs just to be able to afford to cool their homes when it’s hot. Keeping your house cold doesn’t have to be so expensive. If you follow these 10 energy saving tips for summer, you’ll be able to stay breezy and rich the whole season. There’s a common misconception that it takes more energy to cool a really hot house than to maintain a cool temperature all day long. You should never leave your summer AC running when you’re not there to enjoy it. 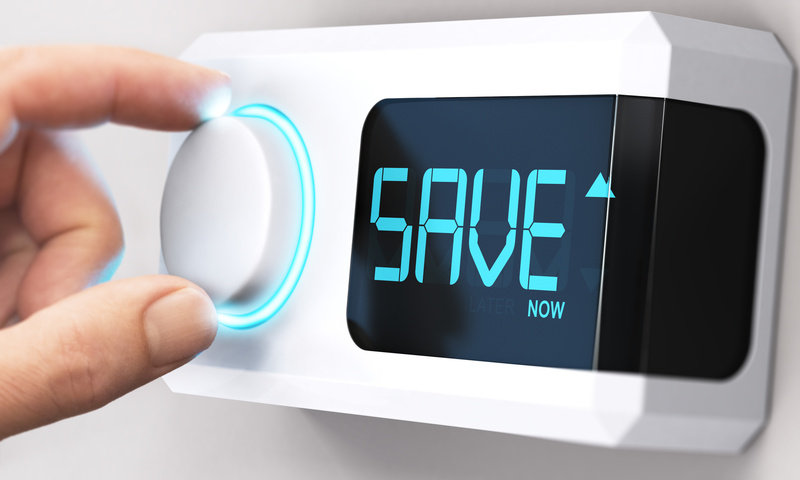 Before you go to work every morning, you should turn your thermostat up to save big on your electric bill. Many thermostats actually come with summer air conditioning settings to make this process easier. These air conditioners have built-in timers, so you can even set your program to cool the house an hour before you come home. That way you won’t have to walk into a muggy house and put your well-deserved relaxation time on hold. Central air is convenient, but it can also be a big drag. It’s helpful for big families who occupy the entire house. However, for individuals or couples who spend the majority of their time in one room, it’s wasting a lot of energy. You can still use your central air to keep the rest of your living space tolerable for the moments you need to be in different rooms. You don’t need to keep the thermostat at a freezing temperature, though. This is when fans become lifesavers. If you invest in on or two strong fans to keep in one room, you’ll save a lot more money than trying to cool an entire house. Another helpful tip is to keep every door closed so that cool air isn’t escaping into other rooms you’re not occupying. If you want to know how to reduce electric bill in summer fast, one place you won’t think to look is your ducts. Air conditioners use a series of ducts to circulate cool air throughout your home. Duct issues can account for almost 1/3 of your cool air escaping. Calling a professional to inspect your air conditioning system is a great way to ensure you don’t have scrunched or leaky ducts. If there are any issues, they can repair the ducts and save you a ton of money and sweat. For any unlucky folks in the Phoenix area who need air conditioning repairs, Hays Cooling and Heating is your best resource for affordable and fast service. Have you ever noticed how long it takes for your clothes to dry when you don’t replace the dryer filters? The same concept goes for air conditioning vents. When dust and other debris clog up the vents, it will take a lot longer to cool your house. It’s always wise to check your air filters every month to make sure they’re not clogged. If you’re looking for the most energy-efficient technology, look for air conditioners that have the Energy Star sticker on them. Overall, appliances with this label save roughly 15% of energy. During the summertime, the sun is your house’s worst enemy. Any window is an opening for heat to funnel inside. Your first instinct may be to live like a vampire, but you don’t need to board up your windows. There are a lot less drastic measures you can take. Instead, try shopping for some window covers that let natural light in but keep the heat out. As you can guess, saving on your electric bill also means turning off lights when you don’t need them. You should always utilize sunlight for natural light year round and heat during cooler months. Just make sure that you’re using can save you an insane amount of money each month on food. However, the thought of turning your oven on when it’s 100 the right technology to seal the cool air inside your house in the summer. Cooking all of your meals degrees outside could make you faint. Yo should still cook, but you have to be a bit more strategic with your methods. If you know you need to cook something in an oven, try to use it in the morning before you leave for work. That’s when you’re going to let the house heat up anyway, right? For dinners, you should invest in an outdoor grill. Not only will it keep your house cooler, but the food will taste delicious. Take a moment to locate where your thermostat is located. If it’s right near a window, then direct sunlight could trick it into thinking the house is hotter than it is. This can sabotage all of your efforts to maintain your optimal air conditioning temperature. Taking the steps to move the thermostat can be a lot of work. If you’re not committed to this home improvement, just be mindful and close those blinds to eliminate the risk of over-cooling. As long as your windows have screens, why not let nature do some cooling for you? At night, temperatures can be quite pleasant. Windy days can also get some fresh air inside. Whenever you open the window, just be sure to double check that your AC is off. There are a lot of crevices where cold air can escape. One of the cheapest and most effective tricks for sealing cold air inside is by installing door and window seals. Now that you know the best energy saving tips for summer, you can kick back and enjoy these warmer months. If you want to stay up to date on all interesting things happening on the web, Internet Vibes is your one-stop guide to everything you could ever want to know. For more awesome advice on how to live a happier life, check out our lifestyle blog.